The maven of Mennonite mysteries is at it again. Magdalena Yoder Rosen is the wealthiest woman in Hernia, Pennsylvania, and she likes to poke her long nose into every remotely interesting corner of the area. She's delighted when the new sheriff she’s hired and whose salary she pays (along with every other town expense) asks her help in finding the murderer of beautiful novelist Ramat Sreym. 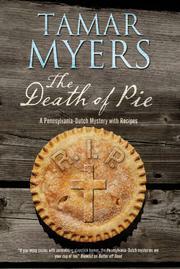 Even after writing a best-seller insulting just about everyone in the local Amish and Mennonite communities, Ramat was invited back to judge the local pie contest, where she inconveniently dropped dead in Magdalena’s apple pie. Unfortunately, the list of suspects includes Mother Malaise, the Yiddishe momme of Magdalena’s husband, and two of her cronies. What to do? Magdalena cobbles together a faux police uniform, jumps in the town police car, and sets out to interview the suspects, a process that leads to alienating friends, promoting a romance and getting accused of the dirty deed herself. There is precious little mystery in this rambling, repetitive tale, which is far from Myers’ best work (As The World Churns, 2008, etc.). Magdalena may be smart and amusing, but her atrocious alliterative amalgamations will alienate many a reader.